Plantar fasciitis: This is an extremely common source of heel pain. Plantar fasciitis is when there is intense inflammation of the connecting tissue between the heel and the toes. The inflammation is usually caused by overuse and by putting too much pressure on the ligament. Symptoms include stabbing pain when taking steps. This pain can be especially severe in the early morning. Heel Spur: A heel spur is a buildup of abnormal calcium deposits near the heel. The main causes include arthritis, wearing ill-fitting shoes, and obesity. Heel spurs are difficult to diagnose without seeing a doctor, but some of the usual symptoms include swelling, inflammation, pain, and warmness of the foot. Surgery may be necessary in the most extreme cases of heel spurs. Bursitis: Bursitis is a condition where fluid-filled sacs build up near your joints. This condition can affect other joints in the body besides the heel. However, when bursitis develops in the heel, the symptoms can be very similar to heel spurs and plantar fasciitis. Symptoms include inflammation, swelling, and sharp pain. Repetitive actions will eventually cause bursitis. Many of the injuries and conditions that cause heel pain have similar treatments. Here are some general tips that you can do at home to reduce heel pain. Resting/ keep weight off the heel: This will allow the injury to heal and prevent the injury from getting worse. Ice it: Icing your heel will reduce inflammation and soreness. Use a brace: Depending on what is wrong, there might be a specific brace that you can wear to help treat it. Wear the proper shoes: Wearing ill-fitting shoes is a common cause of heel pain for many people. Make sure your feet have room to breathe and that they receive the support that they need. Stretches: Stretching can prevent heel injuries and alleviate heel pain. 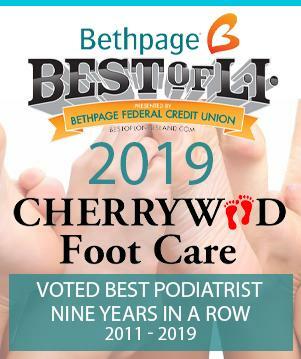 Here at Cherrywood Foot Care, heel pain is just one of the many foot conditions that we can treat. Our foot doctor on Long Island will help determine what heel injury or condition you are suffering from and then provide you with a comprehensive treatment plan. Are you experiencing severe heel pain? Are you looking for a foot doctor on Long Island? Be sure to contact us today!